It wasn't easy but I did it, I sold my beautiful Cannondale CAAD10. I've known for quite some time that even if I continue biking, this isn't the road bike for me. The person who fit me when I purchased it raced, and when I told her I wanted to race triathlons she fit me as she would want - for speed. Smaller frame for lighter bike, more aggressive seat to handlebar drop. This being my first road bike, I truly believe that was a bad way to go. Unfortunately I didn't realize it before I purchased and drove the bike all the way to California on the back of our SUV. As soon as I started riding with the Integrate group last summer, people began to comment on my bike being a small frame (52") for my 5'10" height and my seat to handlebar drop being aggressive. I never felt (mentally) comfortable, I'd even say I feared for my life every time I rode the bike. Every. Time. I had the bike fit again in an attempt to feel better about it, but he didn't change much except for moving the angle of the handlebars to help me feel better in the drops. I continued riding, but even though I loved the group I felt bad about biking. 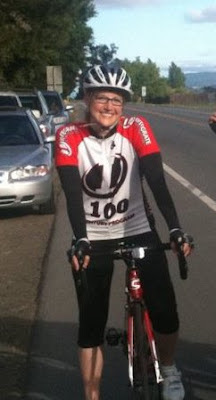 I pushed through hard hill workouts, learned lots of important bike handling skills, and got stronger. A few people even told me I was going to be fast, I was a natural. This made me ecstatic and I kept going for it! Then one August day I went to a Saturday skills clinic with a fantastic Professional Cyclist as the instructor. (Who, by the way, is about to do Ironman Canada!) We worked hard, I climbed Kings Mountain Road feeling pretty darn strong, and continued on our ride. Not too long after, as we were fighting some rolling hills, my knee started hurting a LOT. I had felt a little tweak there before, but nothing like this. I always assumed it was just sore from working hard. The next thing I knew I couldn't put any pressure on it to use the pedal without serious pain, and I stopped along the side of the road. I was completely embarrassed to end up so far behind the group, and I had to have some help from our instructor to get up the hill successfully because I couldn't push on that leg. They helped me cut the ride short and brought my car back so I could load up the bike. Again, so embarrassed. I should be stronger, but I just wasn't. In hindsight, I'm glad I had help and didn't push it. This ride was followed with X-Rays, doctor visits, and rehab. I had pes anserine bursitis and tendonitis in that knee. It hurt, popped when I bent it, and was super swollen. I eventually got through it with sports massage (soft tissue release) and rehab exercises, and luckily running didn't bother it that much after a few weeks. I even squeaked out two fall half marathons somehow, although my speed progress went backwards. When I decided I was ready to go back to the bike, I went for another bike fitting. This guy was great, he changed so many things and really worked to get my legs moving in one plane using both bike adjustments and shoe inserts. Apparently, my previous set up was letting my left knee move a little to the inside when I pedaled and put pressure on it at a bad angle. This fit was much better, although I can't say I ever stopped feeling some knee discomfort even after that fitting. Between the fitting issues, not feeling mentally comfortable with the bike, the aggressive seat to handlebar drop, and the knee never really feeling good, I decided that was it. This wasn't the bike for me. I do hope it's a good bike for the buyer, who was super excited about it! Having someone so happy to buy it made it a little easier to part with. I don't know where I'll go from here, but my triathlon goal is officially off the list for now. If I go back to biking, I know a lot more about what I want and need than I did before and that'll make me a more educated bike buyer. Let's just say...I haven't sold the indoor trainer and given up the idea completely. The moral of this long story? If I knew what I know now, I would have made a different selection and realized I needed a more comprehensive fitting sooner in the process. Learn from my mistakes. Make sure you buy the right bike for you, with the right fit for you! Thats a bummer, I love cycling, not as much as running but I love going out with the group we have here in my town. Hope you are able to get back into it again at some point. I love the group I was riding with too, great social time. Maybe I'll give it a go again in the future! Yes! I'm glad for the support though, because it was hard to do. Thank you! I am glad that you did this. I mean, if you were not comfortable, you were not going to ride it as often as you want. With a bike that is the RIGHT bike you will do so much better! Thanks, I truly believe it was the right decision too. I always looked at it sitting in my hallway and never wanted to ride it! Someday maybe I'll get back to the tri, definitely still interested! I think my friend got a similar knee issue from her bike. I just got a bike and am worried about that, but I plan to only ride casually so I hope any fitting errors don't do me in! Interesting! I wouldn't mind picking up a bike at some point, your post has brought up some good educational points for me, hopefully others too! That knee injury sounds so painful. I'm sorry that you had to sell your bike, but I know you will find the one that is right for you! Thanks, I don't think I'll give up for good. Appreciate the encouragement!